Popular Apple-watching website iLounge claims to have had a first hands-on with iPad 3, behind the scenes at CES. 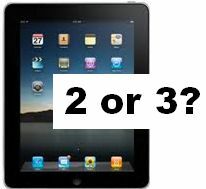 The site's editor-in-chief, Jeremy Horwitz claims to have seen a pre-production model of the upcoming gadget - and goes so far as to claim that others might have seen the gadget too, but it's so similar to iPad 2 that they would have had no idea. Horwitz claims to have seen a casing for the device, not the screen itself - a crucial point, since an ultra-high-resolution screen is strongly rumoured to be the big improvement that Apple delivers this time round.